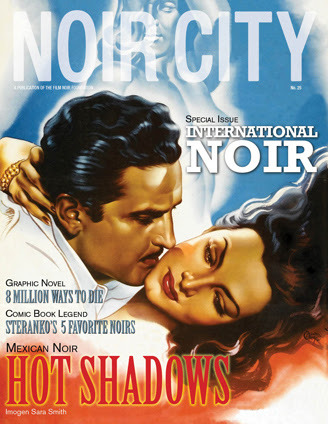 Imogen Sara Smith on the long history of Mexican noir; Jake Hinkson on the heartbreaking crime dramas of Japan’s Yoshitarô Nomura (stream these wonders on FilmStruck before the service goes dark for good this week); the redoubtable Ray Banks takes on the villainous roles of Patrick McGoohan; Ehsan Khoshbakht on Iranian genre films; Nathalie Atkinson on the premier Canadian noir The Silent Partner; and more. On the domestic front, we’ve got a killer 5 Favorites essay from comic book legend Jim Steranko; a look at the twinned noir careers of John Huston and Orson Welles by Brian J. Robb along with a review of their last collaboration The Other Side of the Wind from FNF honcho Eddie Muller himself; and, once again, more. As for my humble efforts, I spoke to both Lawrence Block and artist John K. Snyder III about the recent adaptation of Larry’s landmark Matt Scudder mystery Eight Million Ways to Die into a graphic novel, bringing 1980s New York to raw, vivid life in a whole new way. Plus a pair of book reviews and my Cocktails & Crime column. You know the drill, kids: donate to the Film Noir Foundation and have all this goodness delivered direct to you. Don’t miss out. Because the next issue? That’s one gonna be even better.